Exit to Highway 168 Eastbound. Driving time from Fresno is about 1-1/2 hours. Note: GPS devices may advise a route east from Madera on Highway 145. While this way is more direct, the roads are slower and not as straightforward. The difference in drive time is smaller than expected. Highway 5 North to Highway 99 North. 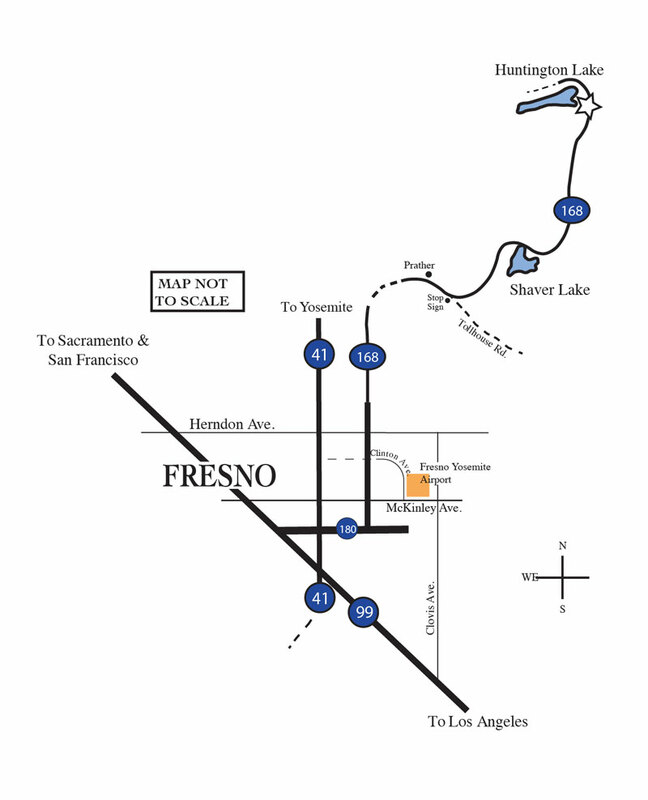 Highway 99 North to Highway 41 North (Fresno) to Highway 168 East. When you see the forest service sign that says “Huntington Lake Recreation Area” you are about 1.1 mile from Gold Arrow Camp. The entrance to Gold Arrow Camp is on the left side of Highway 168, just before the China Peak Resort. Pass the camp road, and continue to the China Peak parking lot (right turn), where GAC staff will meet you and unload your luggage. From there, a shuttle van will bring everyone in your group into our camp site for refreshments and a tour. After good-byes, the shuttle will return parents to the parking lot. Exit to northbound Highway 41. Highway 41 North to Highway 168 East. Turn left on Clinton Ave. Airport is on right. Exit to eastbound Highway 180 to Highway 168 East.